What is Saint Longinus the patron of? Who or what is Saint Longinus the patron saint of? Saint Longinus is the patron of Mantua. Meanings, definition and origins - a patron is considered to be a defender of a specific group of people or of a nation. There is a patron for virtually every cause, profession or special interest. Prayers are considered more likely to be answered by asking a patron for intercession on their behalf. The story and history of Saint Longinus. Longinus is believed to have been the centurion who pierced the side of the crucified Christ with a lance, and after witnessing the Divine manifestations around him, exclaimed, "Truly this man was the Son of God!" Longinus subsequently converted to Christianity and returned to his home in Cappadocia where he made many conversions. He was sentenced to torture and death by beheading under the orders of Pontius Pilate. 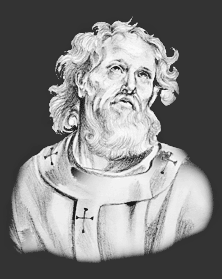 Pontius Pilatus was the governor of the Roman Iudaea province who presided over the trial of Jesus and ordered his crucifixion. There are two categories of saints: martyrs and confessors. A Christian martyr is regarded as one who is put to death for his Christian faith or convictions. Confessors are people who died natural deaths. Date of Death: Saint Longinus died in A.D. 45. Cause of Death: Beheaded. Why is Saint Longinus the patron of Mantua? Why is Saint Longinus is the patron of Mantua? St. Longinus is the patron of Mantua which is where his relics are preserved. It is helpful to be able to recognise Saint Longinus in paintings, stained glass windows, illuminated manuscripts, architecture and other forms of Christian art. The artistic representations reflect the life or death of saints, or an aspect of life with which the person is most closely associated. Saint Longinus is represented in Christian Art wearing the uniform of a Roman soldier, and has a lance or spear in his hand. The Feast Day of Saint Longinus is March 15th. The origin of Feast Days: most saints have specially designated feast days and are associated with a specific day of the year and these are referred to as the saint's feast day. The feast days first arose from the very early Christian custom of the annual commemoration of martyrs on the dates of their deaths at the same time celebrating their birth into heaven.